The following is a guest post from one of the co-founders of Inlu! Enjoy! Got a kid’s birthday party to plan? Why not collect for a group gift and give back to a cause at the same time! 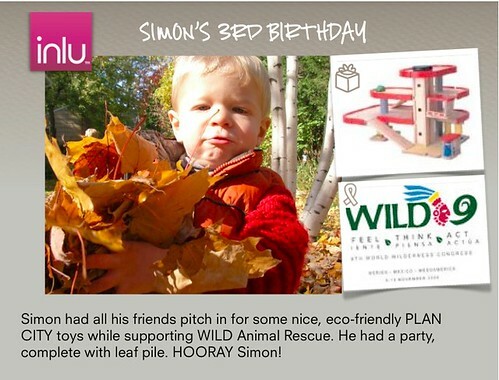 With inlu.com, you can collect enough money to cover a special gift from friends and family and anything above and beyond can be pooled and sent automatically to any cause. This makes everyone happy! Your child gets what he or she wants, guest don’t have to pitstop on the way to the party to grab a gift (we’ve all been there), and you can feel good about going easy on “stuff” that will likely end up in the landfill. Plus, you’ll be supporting a cause “in lieu of all the wrapping paper and cards” your guest would’ve purchased. Sweet, right? 10. Bike- Aaaah, the bike. What better childhood gift than a shiny new bike? When it comes from all your friends and family, it’s even better! 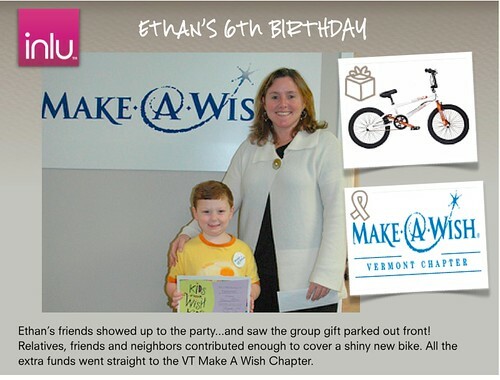 One Inlu user got a bike and gave back to Make a Wish Vermont. 9. 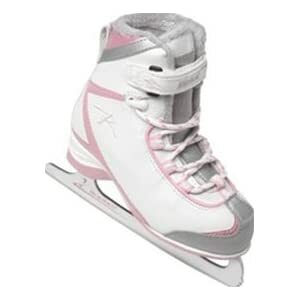 Ice Skates – These are a classic gift that every child can enjoy. They make an excellent group gift. Why not give back to polar bears for a chilly themed charity? It’s up to you and your little skater. 8. Playmobil Pirate Ship – Ahoy Matey! Get a pirate ship, give back to save the seas. That’s a great combo, me thinks. 6. LEGOs – Unlike most gifts, you can NEVER have too many LEGOs! That’s why these make a timeless group gift option. 5. Plan Toy Dollhouse – Another Plan Toy, this group gift is great! We’ve seen a happy little Inlu user furnish her Plan Dollhouse with some sweet new furniture. 4. Nerf Guns- Are a favorite for boys in that “hard to figure out what they want” stage. We’ve seen it-whether it’s one gun or a small fleet, Nerf™ is a just-right choice for boys around ages 8-12. 3. iPod Touch- With tweens especially, the gifts are gettin’ pricey! This is a high end gift that will get plenty of use. They can take pics, play games, listen to music,watch video- and more. As a parent, you can trust this hours of entertainment (perfect for long car rides!). 2. NEW Skateboard- Ask the friends and family to pitch in for a new deck, wheels, bearings, helmet and you’ll have a happy little ripper. 1. Kid’s Kitchen- This big ticket item is one of childhood’s most magical memory-makers. It was a classic when we were little and it’s still on the wishlist for little people everywhere. Inlu idea: you could collect for the kitchen and give back to feed kids in poverty. Skip the runaround and all that gift wrap. Win-win-win! For more info or to create an Inlu, visit inlu.com! Tune in next week for more of our birthday party series blog! All great advertising slogans, TV or radio ads, brochures, web content and other marketing materials rely on good copywriting skills. If you have the power to spin words or move people by weaving words you ought to take this venture seriously. Small business owners usually outsource copywriting to third party providers for it take skills and considerable amount of time to come up with a great copy. Established copywriters charge around $50 or more per hour.